I've had this clock for many years!!! I was excited that I finally owned a Chauncey Jerome Clock. When I started researching this clock, Chauncey Jerome died in 1868. 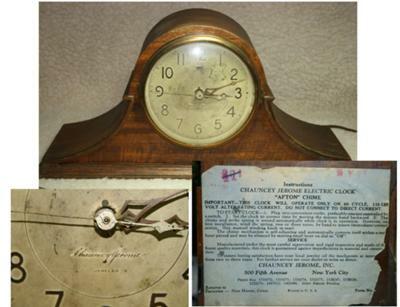 So how could this be a Chauncey Jerome Electric Clock with Afton Chimes, when electricity wasn't used widely in the US until after the 1890's as far as I could research. I would love to know if anyone has any knowledge about this clock. It says on the instructions, "Chauncey Jerome, INC., 500 Fifth Ave. New York City". Return to factories in New Haven, Connecticut. It has several patent numbers on it. Chauncey Jerome is printed on the face of the clock also. Can anyone help me with this mystery? Thanks for your time if you do. I hope someone else has heard of this company, I have not. I know that many trade names are bought and sold all the time so that is probably what happened here. Electric clocks of the type in your picture first started showing up in the 1930's. The New Haven Clock Company of Bristol, CT owned the trademark name of the Jerome Manufacturing Company after it went bankrupt in 1855 owing a lot of money to The New Haven Clock Company. New Haven raised the money to purchase the company. New Haven was in business until they sold the company at auction in 1960. Their factory was in CT. but I don't know if they had offices in New York or not. They did have offices in Chicago, England, and Japan, so I guess they could have had one there. I guess we'll have to see if anyone else knows for sure. Thank You for contributing your story. You can read more about Chauncey Jerome or The New Haven Clock Company on this website.